ITG/Didder player who <3's adding tons of crazy mods? Or even using some SM mods? heres your thread. brag about all the crazy sightreading, speedreading, and crap that you do here. Someone else can make a thread for pump and other stuff. For now, we're going for-panel (and solo i guess). EDIT: I've decided that IIDX and BM would make a good fit. 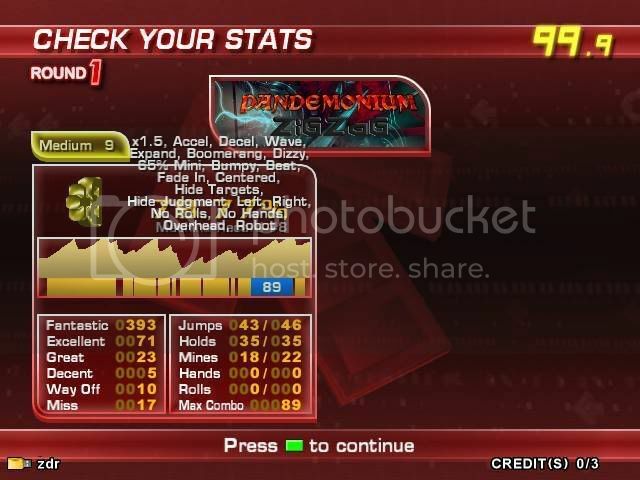 and eventually PiU maybe, but i've heard it's lacking in the mod department (i havent actually played it tho so dont quote me on this.) also, with this now in place, when you post an accomp, let us know what series it's from. or even what game in that series. Passed 5.1.1. Heavy dark reverse x5 at the arcade. I think I played PS on 3x and got about 3/4 of the way through a coupla weeks ago. Maybe I'll freestyle Silent Hill *something christmas mix* 1x boost stealth dark shuffle for christmas in front of a bunch of hot girls if I go to the arcade soon.